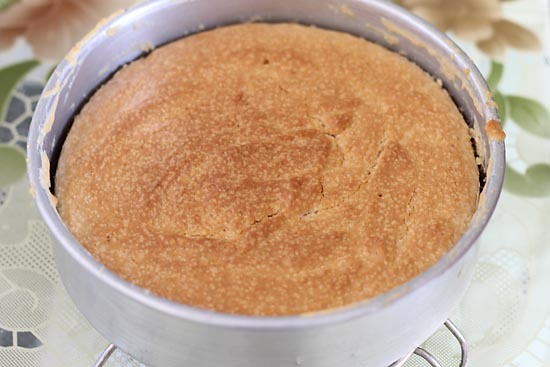 Eggless Vanilla Sponge Cake recipe with step by step photos. 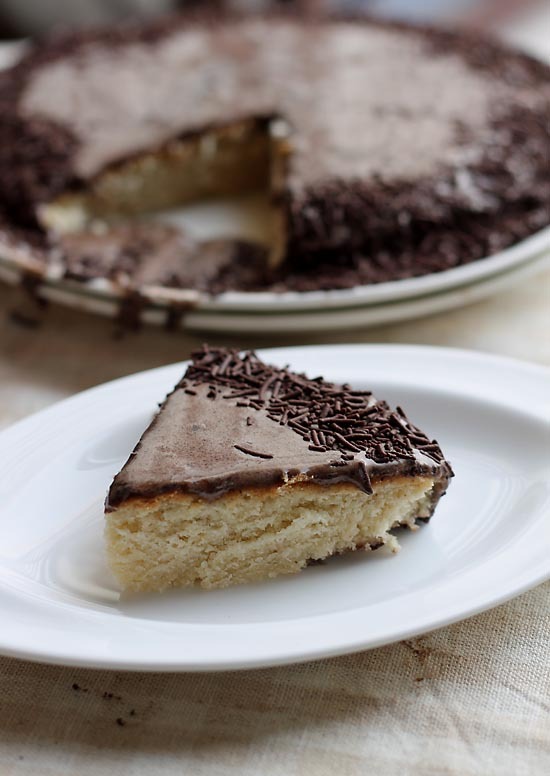 A vanilla sponge cake which is easy and egg free. We don’t have any constraint on eggs at home but not a huge fan of cake with eggs. So this eggless cake is for all the vegetarian readers also for people who are allergic to eggs and lastly for those who do not love eggy odour like me. To replace eggs I have used baking powder and towards the last stage I add 1 tbsp hot water + 1 tbsp vinegar + 1 tsp of baking powder. This formula always work for me for eggless cakes. 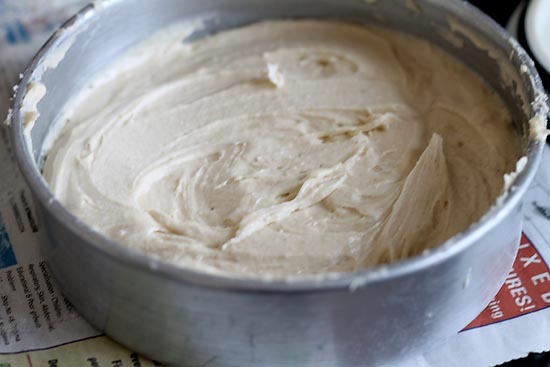 For the moisture in the cake you could use yogurt, milk, flaxseed paste, apple sauce or condensed milk. I have used milk plus water. Had made this cake for one of hubbys friend who had sent us Diwali sweets and savories. So as a token of love I would be sending this cake for her. To make the cake further special I have frosted the cake with chocolate ganache. Mainly chocolate ganache is cream and chocolate but I have added some butter for the lovely glaze and shine. To make the frosting is optional but it does make your cake look elegant. Also won’t be surprised if the cake gets over soon. In this case make more batches of cake. Usually vanilla cake get’s over too soon at our house. Personally I love any cake made with love and preferably less sweet. Another advantage of making eggless cakes are less pans used, less of beating and more faster baking. Moreover you could use this cake as base for any frosting cakes like angel cake, trifle cake, sandwich cake, fruit cakes or jam cakes. 1. Preheat the oven for 15 mins before baking. Grease a 7-8 inch pan with butter. Sprinkle some flour and dust extra flour. 2. Sift flour, baking powder, salt and cornflour. Keep it aside. 3. 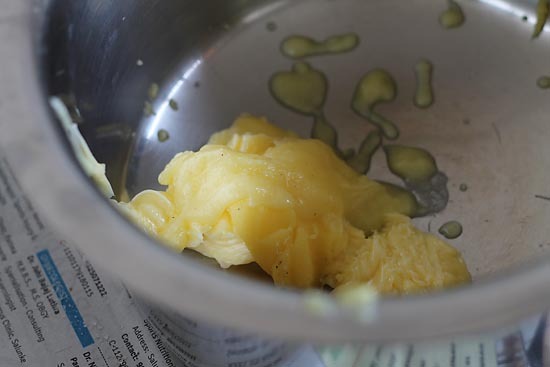 Take butter or ghee at room temperature. 4. 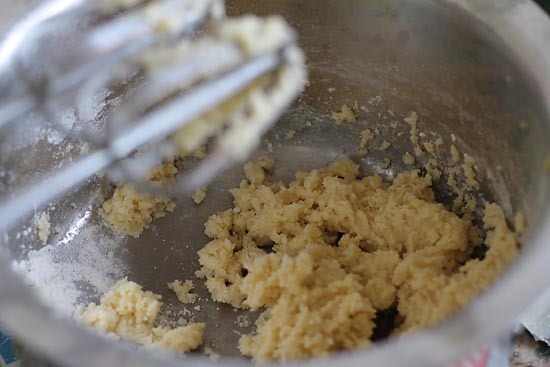 Mix powdered sugar or granulated sugar with butter. Beat until light and fluffy. 5. 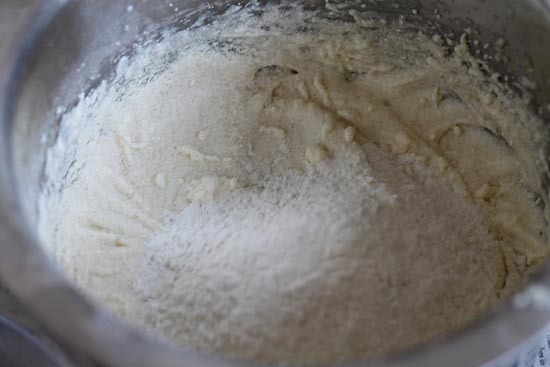 Gradually add milk in batches and keep beating the mixture. 6. Now add sieved flour into batches of three. 7. Cut and fold the mixture gently with the help of spatula. Add water only if the mixture is dry else don’t add. 8. Put vanilla essence and fold gently. 9. 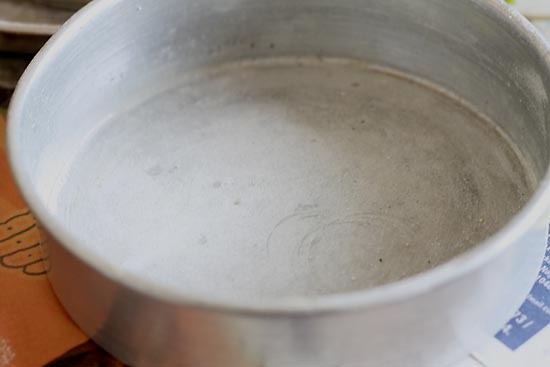 Quickly mix vinegar + hot water + baking powder or soda. Stir nicely and Add the vinegar mixture over the batter. Gently fold into the batter. 10. Pour the cake batter onto the greased pan. 11. Bake at 180°C for 30-35 mins or until skewer comes out clean. 12. Allow the cake to cool down. For the frosting double boil the chocolate or choco chips until they melt. Combine all the ingredients and chill for 1-2 hrs. Unmould the cake spread the frosting all over the cake. Decorate with candies. 13. Serve the eggless vanilla sponge cake with frosting or without frosting warm or chilled with tea. 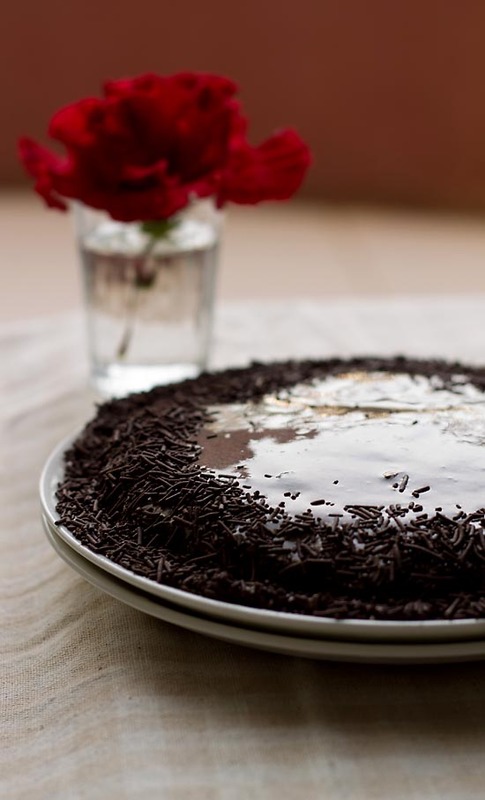 If you are looking for more cake recipes then do check eggless vanilla cake, eggless mango cake, eggless banana cake, eggless tresleches cake, cardamom cake, christmas fruit cake and wine chocolate cake recipe. 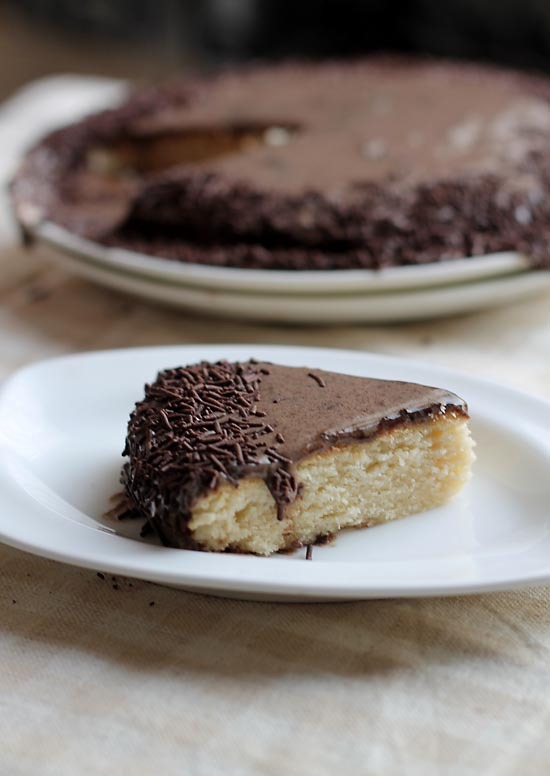 Eggless Vanilla Cake with chocolate ganache frosting. Preheat the oven for 15 mins before baking. Grease a 7-8 inch pan with butter. Sprinkle some flour and dust extra flour. 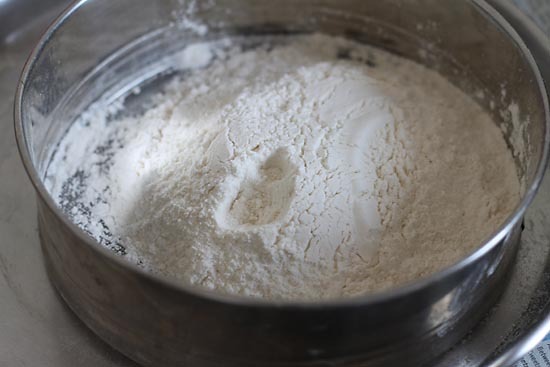 Sift flour, baking powder, salt and cornflour. Keep it aside. 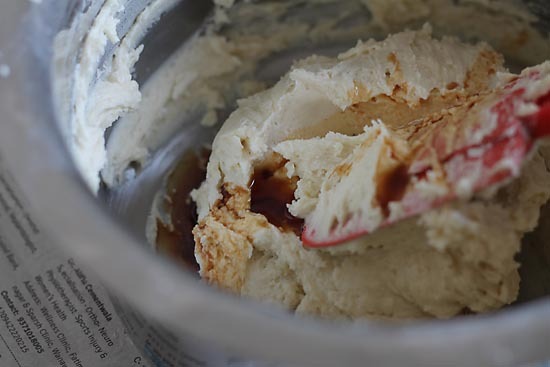 Take butter or ghee at room temperature. Mix powdered sugar or granulated sugar with butter. Beat until light and fluffy. 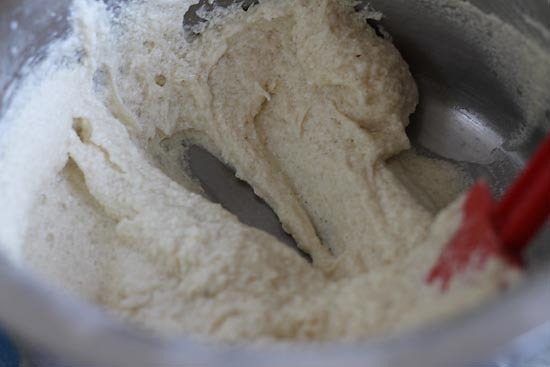 Gradually add milk in batches and keep beating the mixture. Now add sieved flour into batches of three. Cut and fold the mixture gently with the help of spatula. Put vanilla essence and fold gently. 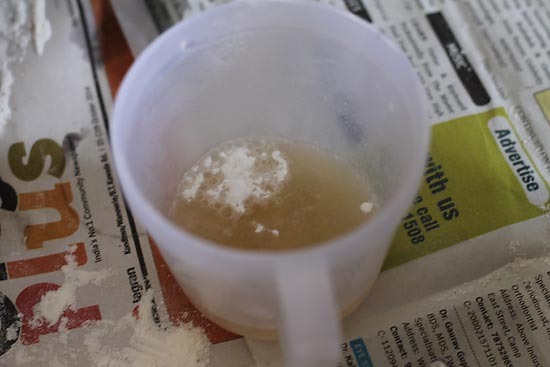 Quickly mix vinegar + hot water + baking powder or soda. Stir nicely and Add the vinegar mixture over the batter. Gently mix. Pour the cake batter onto the greased pan. Bake at 180°C for 30-35 mins or until skewer comes out clean. Allow the cake to cool down. For the frosting double boil the chocolate or choco chips until they melt. Combine all the ingredients and chill for 1-2 hrs. Unmould the cake spread the frosting all over the cake. Decorate with candies. Serve the cake with frosting or without frosting warm or chilled with tea. If you are using a sweet frosting then add sugar accordingly otherwise your cake would taste too sweet. Add sugar as your prefer. Please don't over-mix the cake or over-bake the cake. Add water only if the batter is dry else it's not required. Thanks for the simple yet delicious recipes. I tried some of them and they came out great . I just wanted to ask if you can share butterscotch cake recipe. That will b great . Thank you :). Pleased to know this Rhea 🙂 thanks for positive views and encouraging words. 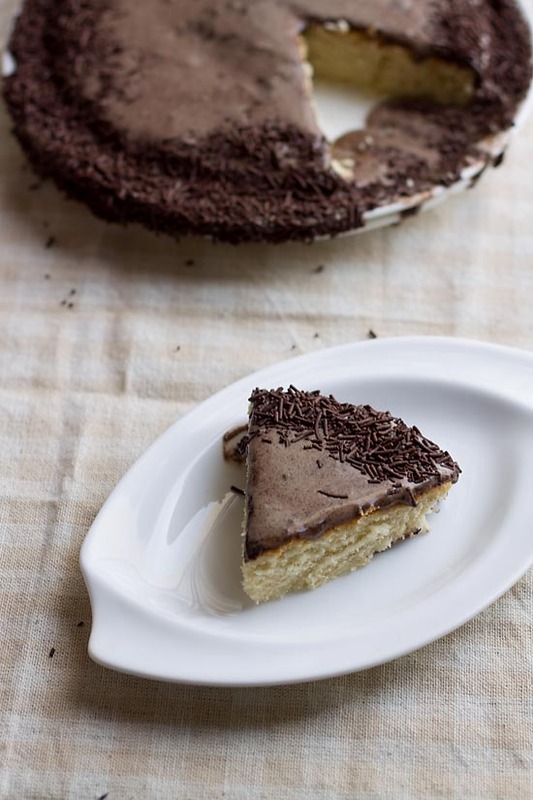 Dear can I add half wheat flour to this…. Yes Shubha you could add half wheat to the cake. 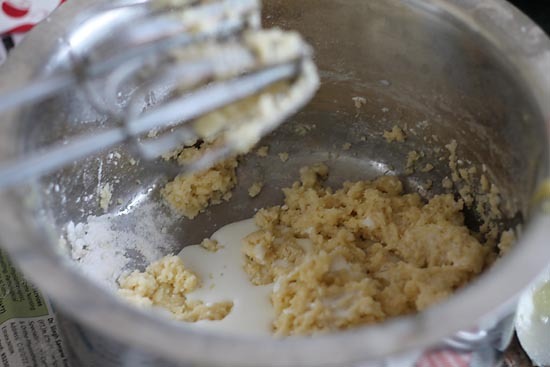 Wheat flour requires more moisture so just check the batter if they appear dry then add 1 or 2 tsp milk in the batter. Hope this information helps you and do let us know how the cake was? I’ve been searching for an eggless sponge cake so I can attempt a Yule Log (Bouche de Noel), and this looks like a wonderful recipe to try. I’ll let you know how it turns out! Thankyou Andrea 🙂 do try and lemme know how was it? Wish you a merry Christmas in advance.